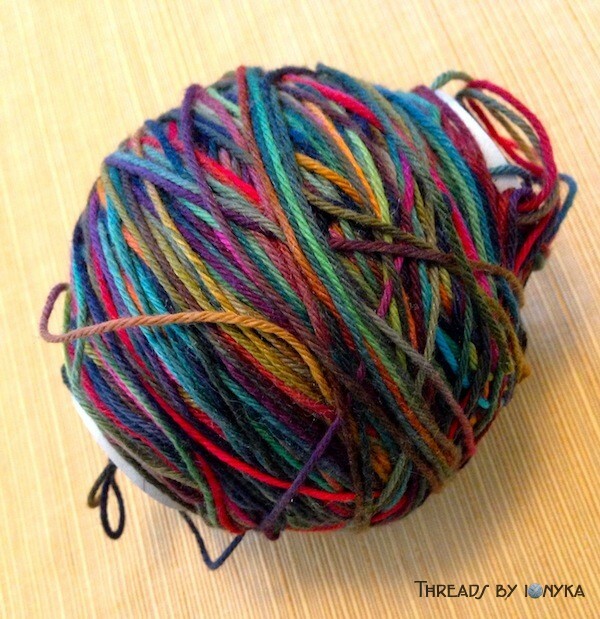 I picked up 2 skeins of this yarn from Uncommon Threads recently, I am a big fan of green and was really taken by this yarn with so many colors, but they all seem to come together. 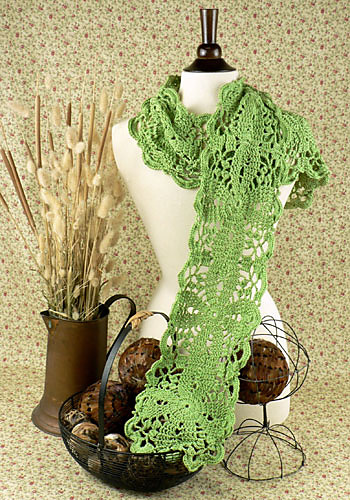 I did not know the name of this yarn was Macau prior to comparing it to the rainforest when choosing a name for this scarf either! (I do seem to be featuring a lot of scarves lately I know, I will try and do a hat or something soon instead if I can…) It is super soft, as all yarn I buy has to be, and since its mostly cotton I wanted to find a pattern that was good for any season. For those wondering, I got the idea to wind yarn onto a toilet paper roll after seeing this Pinterest photo. 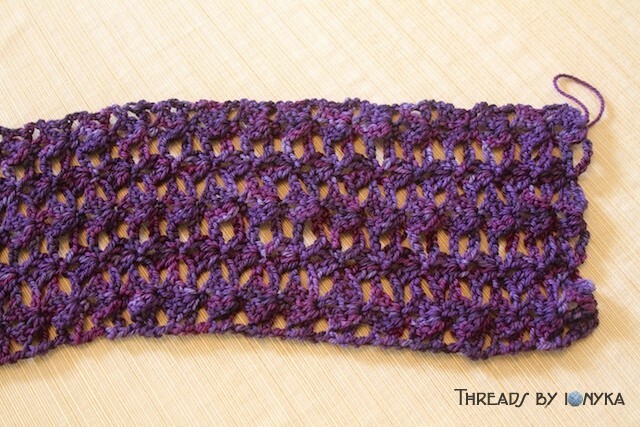 So far I have only done 1 of the squares needed for this scarf. I do really like how it is turning out. I wanted to note that I changed my hook size to a G, instead of the I that is recommended for the pattern, I started with the I hook and it was way too loose. The G is working out great for this yarn for me. Otherwise I am following the pattern as described and will update again when completed! 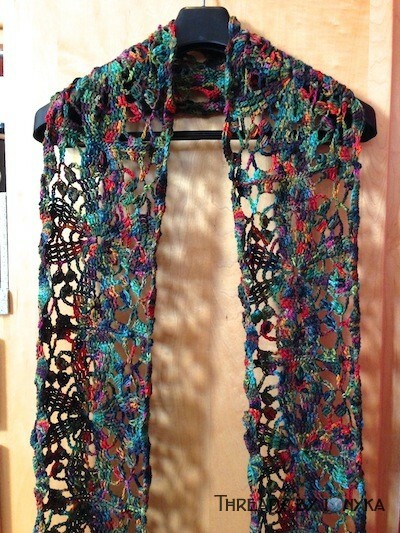 After a few weeks of neglecting this project I finally got into gear and completed it! 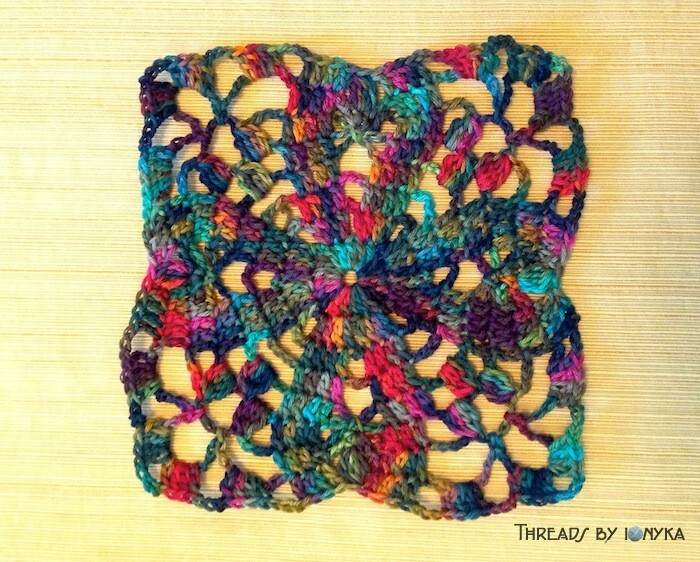 I followed the pattern and made 8 squares, and then did the edging. The only change I made was on the edging where I only did 10 dc instead of the instructed 14, I wanted to ensure I had enough yarn left over at the end. I adore how it turned out!! Photos below! 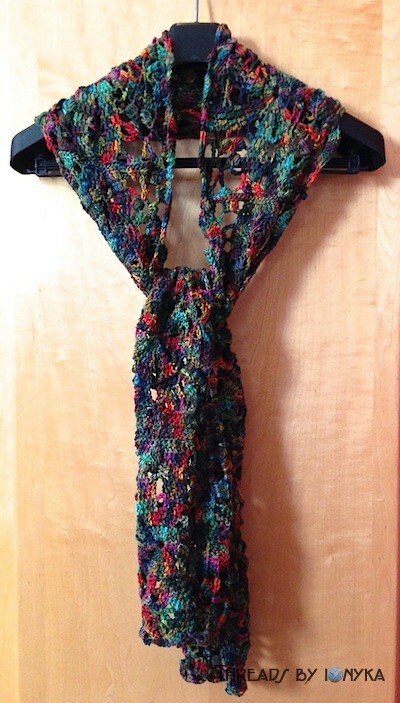 This scarf found a home shortly after completion at a craft fair! My shares for the weekly #HappyHandMade event sponsored by Daft Crafts! 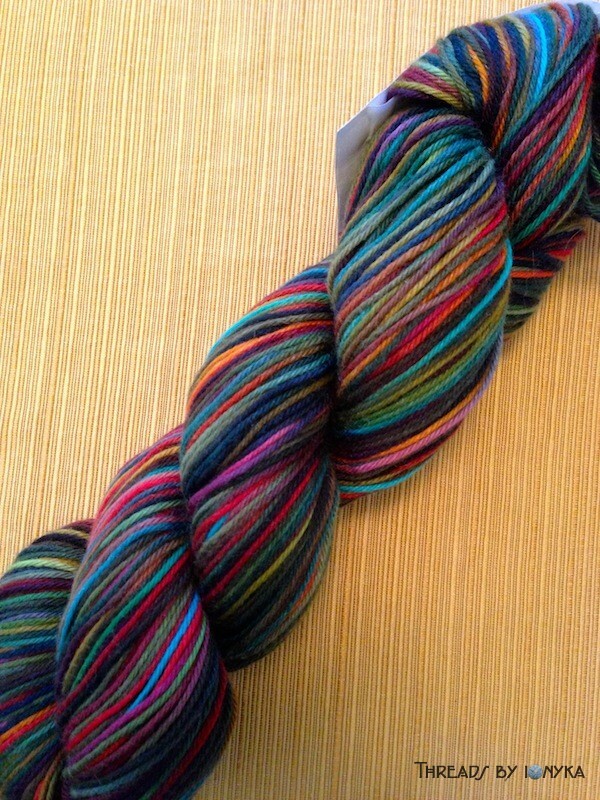 The photo does not do this yarn justice for how amazingly colorful it is. 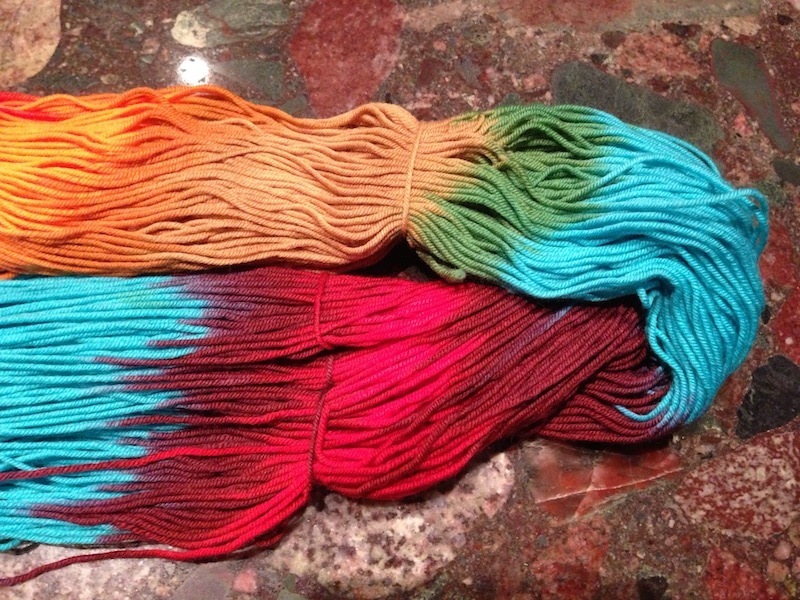 It is literally a rainbow in yarn form. 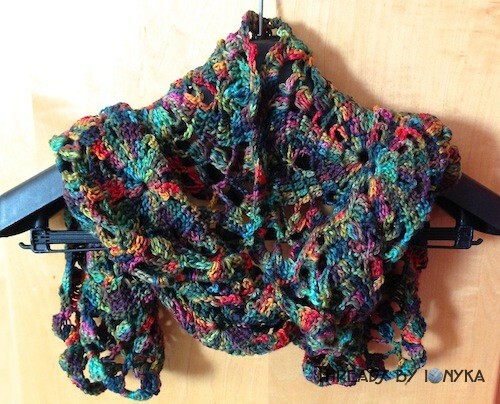 I so wish I could find more but alas the company is no longer in business so I knew I had to choose wisely to find a pattern that shows off this rainbow yarn perfectly! 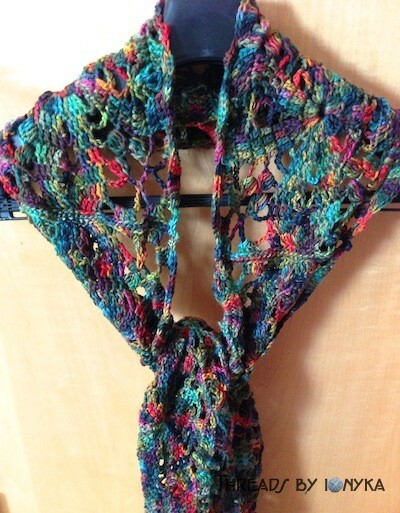 I came across this pattern on Ravelry and instantly knew, this was the right pattern to show off the ribbons of color in this yarn. 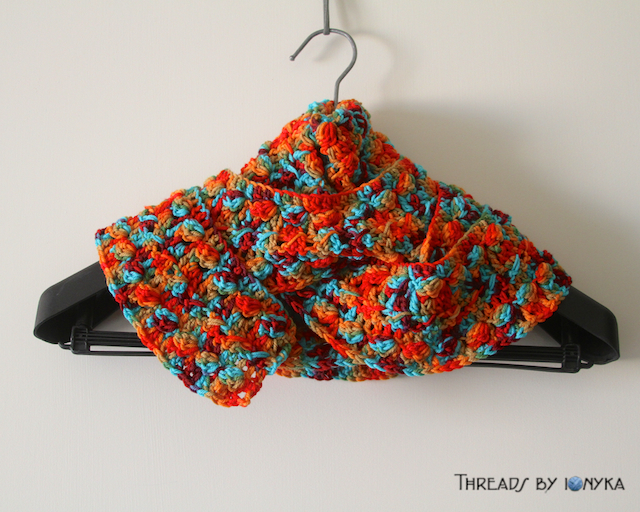 So, I know as I continue to crochet I am going to come across things I make that I have trouble parting with, however I know that I will usually have enough will power to list almost anything despite how much I like it. But I am so keeping this one for myself I can’t dream of parting with it, check out the photos of how it turned out! I did not end up having enough yarn to fully complete the pattern, it came out super long, but I love how the rows lined up with the color changes just enough to really make it look like a rainbow. Needless to say I am thrilled with the result and cannot wait to show it off this winter! Thanks for stopping by for another Mashup! 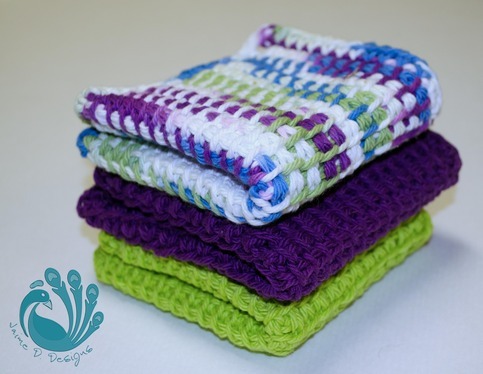 After doing a few of these neat yarn and pattern combos I have decided to call them Mashups! I am learning that I really like finding cool patterns and matching them with an interesting yarn that really makes the two compliment each other. I hope to feature these mashups every week or so. I will give them my own unique names so the owners of the yarn and pattern can retain their titles for their respective products. 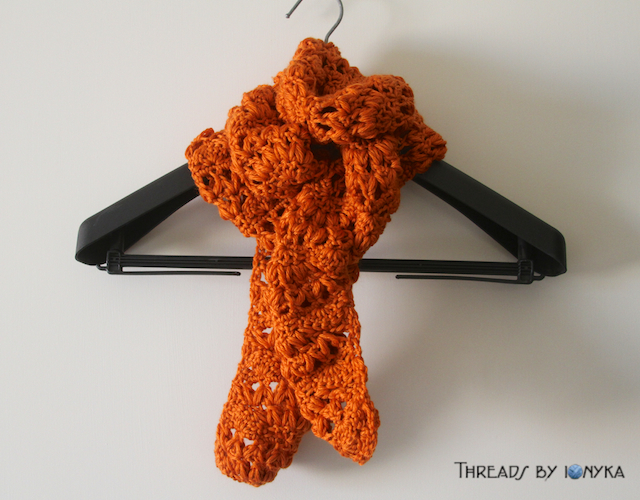 Ok on we go to this weeks Mashup: Autumn Leaves Scarf! 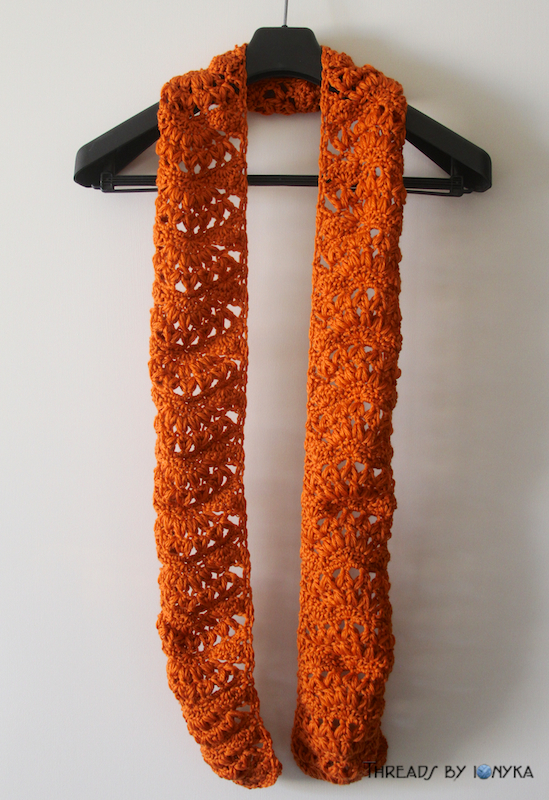 While not exactly an exotic yarn, I really love this color orange. 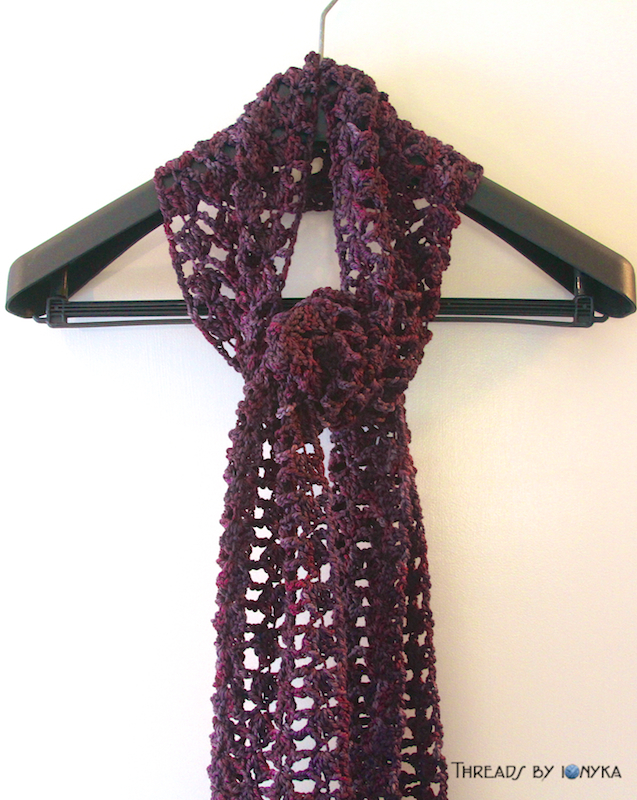 I knew I wanted to find a pattern that would be able to be worn in the Fall to show off its wonderful color. 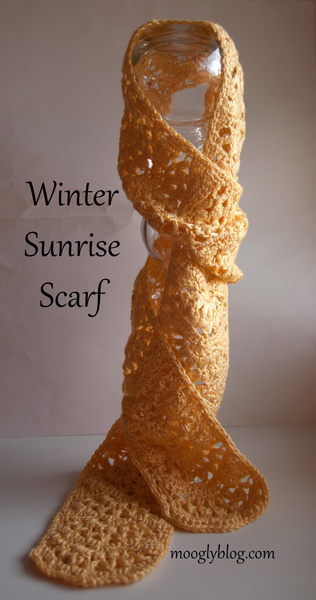 It uses a cluster stitch that makes it puffy but still airy enough to wear starting in Fall. I admit after 3/4 completed I realized I was supposed to stop half way and go back to the start to made the other side match. The pattern causes an arc as you go so the end is rounded. I did not do this haha so not wanting to undo so much work I improvised with 2 rows of shells at the end to make it more flat so it resembled the beginning more. 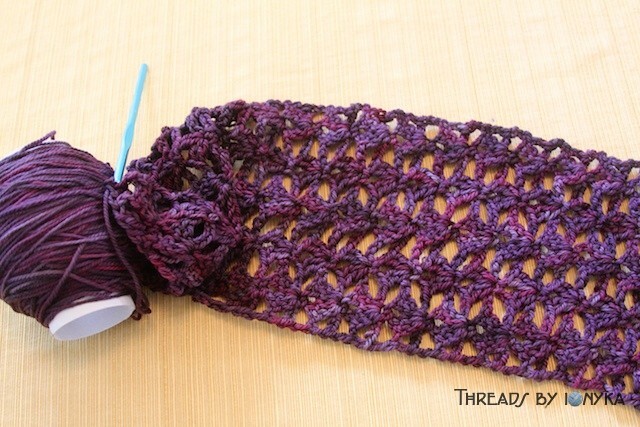 I am going to definitely use this pattern again and this time make sure I follow it the correct way! 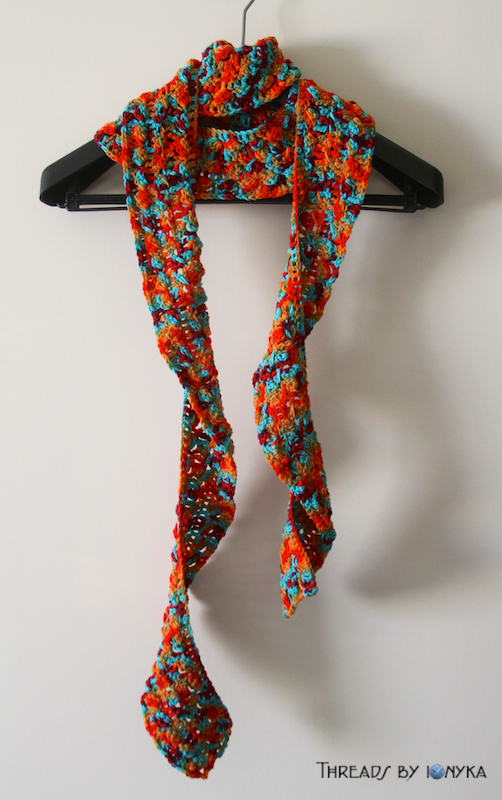 However I am super happy with how it turned out, here are some photos of my completed Autumn Leaves Scarf. This item is For Sale! 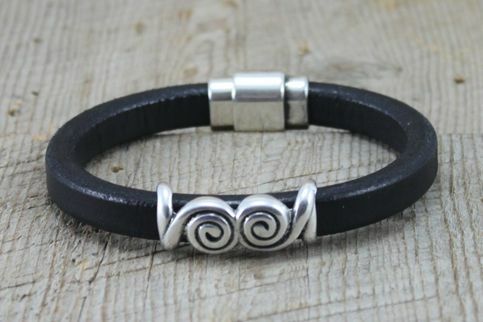 Link to Etsy Product Page! 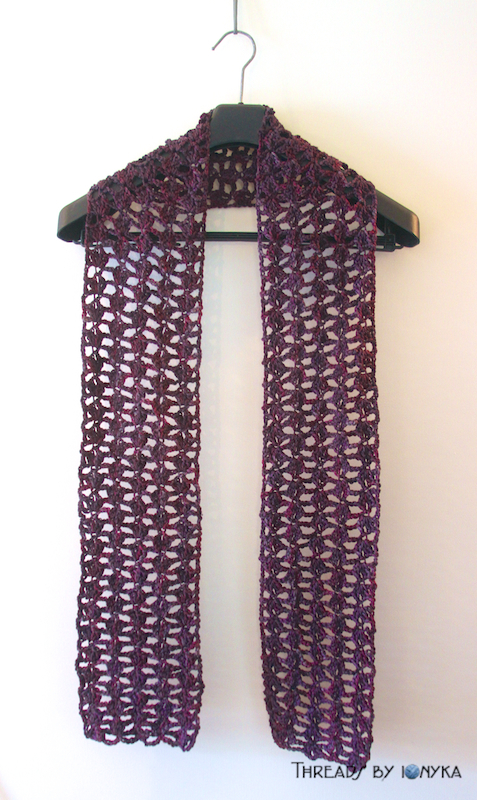 Another fun yarn/pattern combo that I found that I am going to call Plum Lace. Details below! 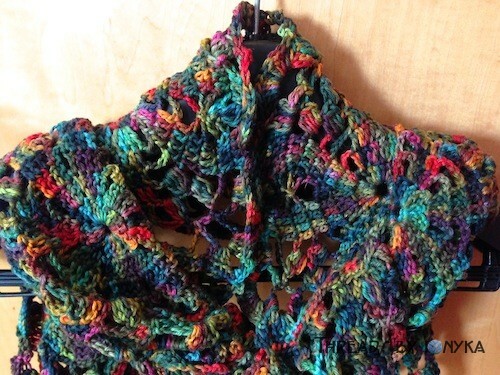 It works up quickly but looks really intricate, so I hope to finish it soon and will post a photo of the completed scarf! Completed! The final dimensions are 6in width x 60in length. 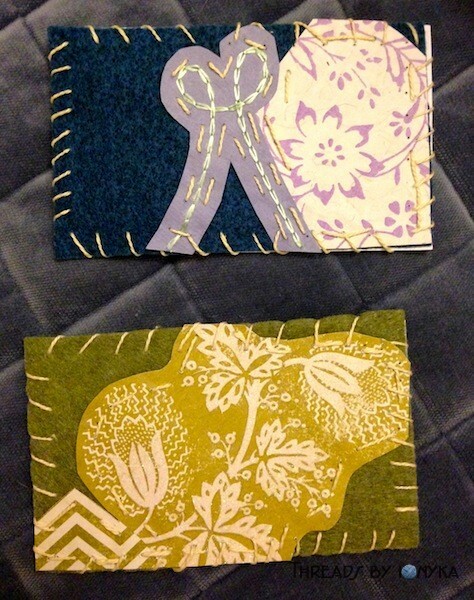 I attended another SFEtsy group Meet & Make last night at the San Jose Museum of Quilting and Textiles. This one was run by Armani Mondragón and our craft project was to make cute felt note cards. 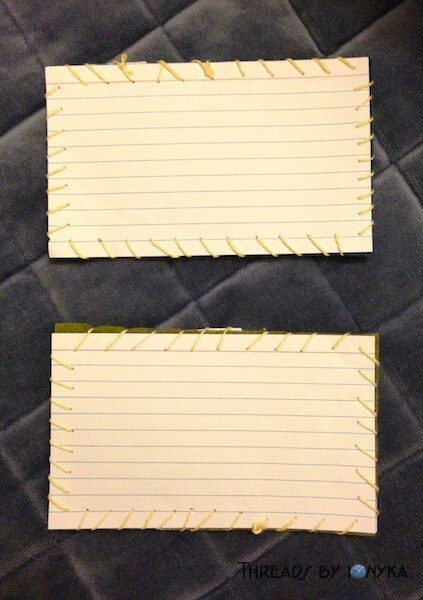 You take a plain note card and cut felt and decorative paper to size and shapes you want and then sew them together with thread or thin yarn. Super fun and simple enough for kids even. I was deciding what to do with my cute note cards now that they are finished, and I thought they would make great decorative recipe cards. 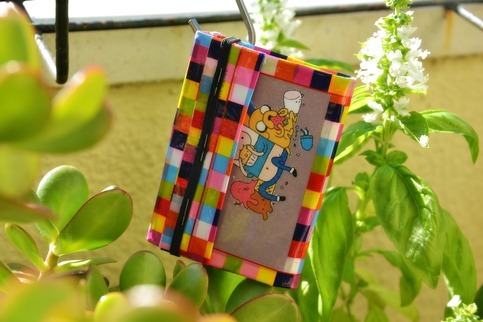 This project would be a great way to gift recipe cards to friends and family, for birthday gifts, shower gifts etc. I really liked the event and look forward to going to more of them! 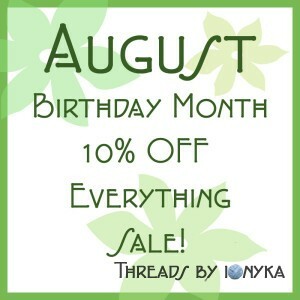 Sale – Birthday Month 10% off SALE! 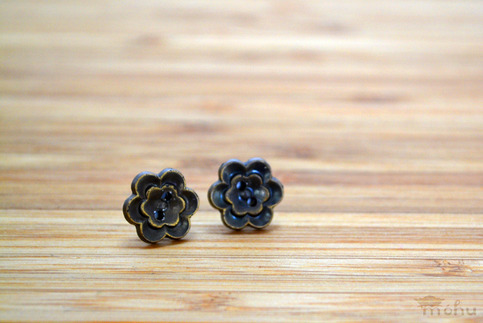 Please help celebrate my birthday month and Get 10% off everything in my shop!